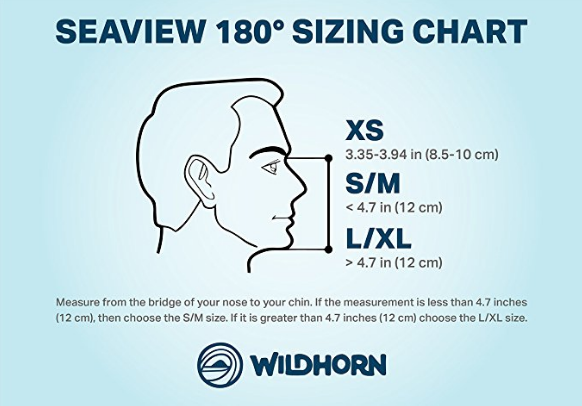 If you are on the lookout for a high-quality, durable yet cheap full face snorkel mask, the Seaview 180° by WildHorn might be the perfect choice for you. With it’s futuristic design and exceptional quality, it’s no wonder this product has become a worldwide favorite. The secret to it’s success? Combining innovative design with proven production methods. It’s no wonder this full face snorkeling mask has amassed over 2000 reviews on Amazon. The design of the full face snorkeling mask differs from the traditional one, helping it bring unique characteristics to the table. This is why previous concepts for snorkeling masks have never enhanced the underwater experience to the same extent as this one. The lens of the full face snorkel mask allow for a 180° view. Made exclusively from Polycarbonate to be completely shatterproof. 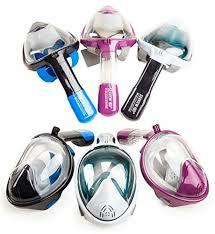 The dry top snorkel system lets your face stay dry when snorkeling. The lower breathing chamber will allow you to breathe through your nose, just as you would on land. The separate breathing chambers will never let air you exhale come in contact with the lens. This means that unlike traditional masks, this mask never, ever fogs up. While it provides the same perks as the traditional snorkeling mask, the design of the Full Face Snorkeling Mask enables us to do much more. This is because of some key features that are unique to this product. The first major difference in design when it comes to the Full Face Snorkeling Mask comes in the snorkel placement. Unlike traditional masks where the snorkel is fixed to the mask by securing it to the strap, the SeaView 180° places the snorkel on top of the mask. This helps immensely when you are trying to determine the position of your snorkel while turning and tilting your head underwater. Lack of awareness can effectively turn your snorkel into a drinking straw, which by any means is not a good thing. 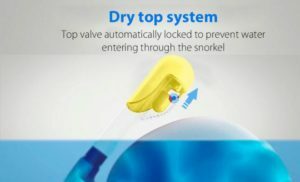 In order to prevent water entering your mask when diving down or otherwise submerge your snorkel, a Dry Top System was installed. It consists of a float in the snorkel that does not obstruct the flow of air, but blocks any water from entering. Although effective, the Dry top System only solves one part of the problem. In order to keep your face dry while snorkeling , no water should be able to enter from the sides as well. The silicone sealing outlining is there to ensure exactly this. With traditional mask designs, the hardest part to seal is the area between the nose and the upper lips. This is because the skin on this part of the face has the most irregular form. Another problem is that people will sometimes unconsciously breathe out from the nose. This air, having nowhere to go creates pressure and breaks the seal, letting water in the mask. Another problem with placing the silicone seal there is skin irritation. After prolonged period of snorkeling the gentle facial skin above the upper lip starts reddening and eventually itching. These issues are not present with the full face snorkel mask design simply because the seal never comes close to this area. The silicone seal runs from your forehead, along the sides of the face to your chin. The silicone straps will also ensure that the seal that the mask has created is tight and waterproof. 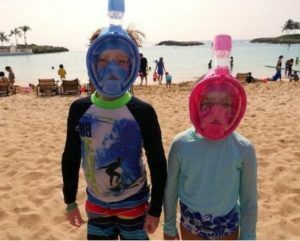 This especially comes in handy when it is used by children and beginner/amateur snorkelers, since they tend to touch the mask the most. The Full Face Snorkeling Mask hosts a Dual Chamber system. 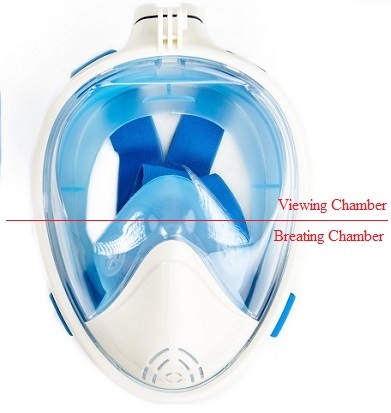 The top part of the snorkeling mask is the viewing chamber, while the bottom part is the breathing chamber. When snorkeling, we often come across the problem of the mask fogging up. This usually happens because small amounts of air escape through our nose. With the separation of the viewing area and the breathing apparatus, the Seaview 180° has effectively solved this problem. When using it, your nose and mouth are completely isolated from the viewing glass so this mask never fogs up. Separating the breathing and viewing chambers also allows for the lens to be much wider than those of traditional snorkeling masks. Previously, the only effective way for producers to create a tight waterproof seal between the face and the mask was to place the seals closely to the viewing area. By expanding the viewing chamber, the seal is further away from the eyes, thus allowing for a full 180 degree view lens. The lens are made from shatterproof polycarbonate, making them very hard to break or crack. Since the breathing chamber encompasses the nose as well, you are no longer limited to breathing only through your mouth. Most beginners need time to adjust to breathing only through their mouth when snorkeling for the first time. The ability to breathe normally through both your mouth and nose, just as you would on land, eliminates this. It also eliminates problems for any people that might have trouble gagging on the snorkel itself. It is interesting that the Seaview 180° also lets you do something that the producers didn’t initially consider. With the whole lower chamber dedicated to the breathing apparatus and the need for a snorkel eliminated, your mouth is free to talk underwater. The sound will be muffled, but it’s still much better than taking off your mask just to communicate with people from your group. When it comes to Full Face Snorkeling Masks, the SeaView 180° has solved a couple of problems that other models have failed to address. The GoPro mount is much more adjustable and allows for much more flexibility when it comes to choosing the right shooting angle. While other models also have it, the one on the SeaView comes second to none. What makes it stand out and be exceptionally good is the positioning. The full face mask, although being quite large, is very light. At 1.35 lbs it is up to 50% lighter than other models available on the market. The high volume of air combined with the lesser weight also makes the mask very buoyant. This makes it impossible to accidentally submerge your snorkel and cut off your air supply unless you are trying to dive in. Buying a mask for your child can prove to be problematic since kids tend to have smaller or irregularly shaped faces. The mask comes in 3 sizes (XS – S/M – L/XL) which combined with the extra safety features makes it the perfect choice for children. 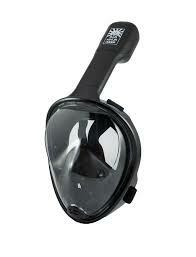 In fact this mask made it to our list of safest full face snorkel masks for children. Full face snorkeling masks tend to be a bit delicate when it comes to packing. The GoPro mount on the Seaview 180° is no exception. This is why the tube on top is completely removable for easier packing. The clip on mechanism makes attaching and detaching the snorkel very easily. 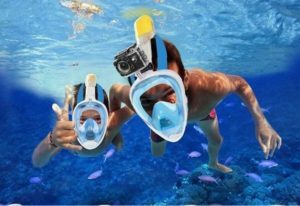 The full face snorkeling mask is designed having the beginner and amateur snorkelers in mind. The design is conceived to enable natural breathing while the face of the user stays completely dry. Not being able to pinch your nose makes freediving at depths of more than 10 feet impossible. The larger amount of air trapped within the mask will also not allow for deeper diving. While a traditional swimming mask and snorkel set might allow for swimming laps or swimming training, the narrower tube on the full face snorkel mask is not the perfect choice for it. After swimming for some time, you will start feeling the lack of oxygen within the mask. That is not to say, however, that you cannot swim from one snorkeling location to another. The more delicate design will also require more care, but this only applies before you place your mask in storage for a longer period of time. During periods of intensive use, the full face mask requires the same amount, if not less care than the traditional type, since the inside of the mask will never touch salt water. There are a couple of reasons why we recommend buying a Full Face Snorkeling Mask and why we recommend getting the SeaView 180°. 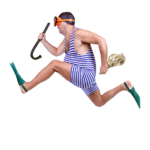 First of all, full face snorkeling masks provide a fuller, more enjoyable underwater experience. The 180 degree view combined with the easiness of breathing take snorkeling to a whole new level. Second, the extreme ease of use makes it suitable for both children and beginners. Third, we found it to be the best mask to use when snorkeling in a group, since you can always see your buddies and even talk to them. WildHorn Outfitters make one of the best masks out there comes from the fact that their design is durable, the materials are of high quality and the tube is completely detachable. However, the versatility of the GoPro mount is what takes the spotlight with this design. The 3 different sizes that they offer will fit on over 95% of faces as well. As we mentioned in the previously, when storing your full face snorkeling mask for longer periods of time you must pay a little more attention than when doing so with a traditional one. The bottom chamber of the mask consists of numerous chambers and valves. If even the smallest amounts of water were to stay there for longer periods of time, there will be a risk of mold developing. Mold can be very dangerous if inhaled directly. This is why it’s very important that you completely dry out your mask before storing it. You will need to wash out your mask thoroughly once again before using the first time when taking it out of storage as well. Another delicate part that you need to pay attention to is the glass of the viewing chamber. You should never wash it with toothpaste since the granules combined with rubbing can damage the glass. Wash your mask with liquid dish soap instead. If you have problems with your mask fogging up because of the temperature difference between your face and the water, instead of spitting, revert to using Anti-Fog Spray instead. Last and also very important, keep it out of reach of children. The design is durable but not made to be played with. Creating the water tight seal requires your mask to be sized properly according to your face. A mask that is too large will leave water entering from the sides and a mask that is too big would break the seal at the chin and forehead areas. Most adults, however, will fall into the S/M size. This size covers faces with nose bridge to chin length between 10 and 12 cm ( 3.94 – 4.7 in). For people with elongated or otherwise irregularly shaped faces where the bridge of the nose to chin distance is beyond 12 cm (4.7 inch) the L/XL fits best. Feel free to refer to the chart below in case you need any additional information.